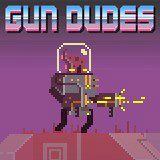 Gun dudes never abandon each other, so in this game they have to fight together. Have fun killing enemies and make sure that you deal with both direction equally. Kill monsters and robots before they reach.